I turned around and eyeballed the young man who had just tried to buy me as his wife. All in white with burnt orange Berber slippers, he waved at me enthusiastically. Behind him the sun reflected blindingly off hundreds of ceramic bowls. From aqua greens to ochre reds, they hung from the walls and were piled up to where the roof should have been. 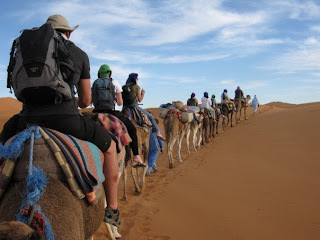 I paused to consider the offer before continuing toward the medina: I could have bought the entire souk with six thousand camels, let alone a single stall. 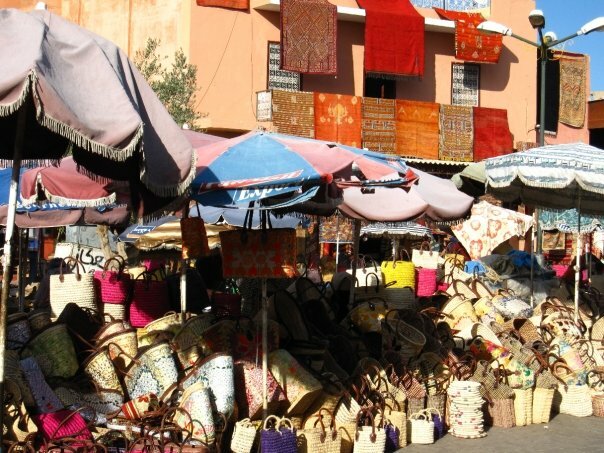 Since the eleventh century, Djemaa el Fna in Marrakesh has been the doorway to the most alluring and colourful market in Africa. Upon entering the square there is an overwhelming sense of having been transported to Agrabah's marketplace in Disney's 'Aladdin.' Before a second has passed, a chained monkey has been thrust onto your shoulder. It is only when you are forking out what seems to be an inordinate amount of money for a photograph that you notice the puff adder three meters away, swaying hypnotically to the snake charmer's whining song. The souks are a maze of stalls roofed with thin sticks that cause shards of light to pierce the dusty market air. The aroma of freshly cut leather wafts from bags and slippers hanging claustrophobically around you, whilst silver teapots, lamps and mountains of jewellery sparkle seductively. Outside the carpet stalls youths wearing Bob Marley T-Shirts and sporting dreadlocks perch opposite old men with deep, crevassed wrinkles reminiscent of the nearby Atlas Mountains. Both generations ask only one thing of you: "Just a look – looking is free!" Deep in the souk the spice market materialises. Impossibly balanced cones of red cumin and yellow mustard powder tickle and tease your nostrils. Shouts of "Hey Skinny! Hey Fish and Chips!" are projected in the hope of luring tourists into stalls because, obviously, that is what Western females long to hear. 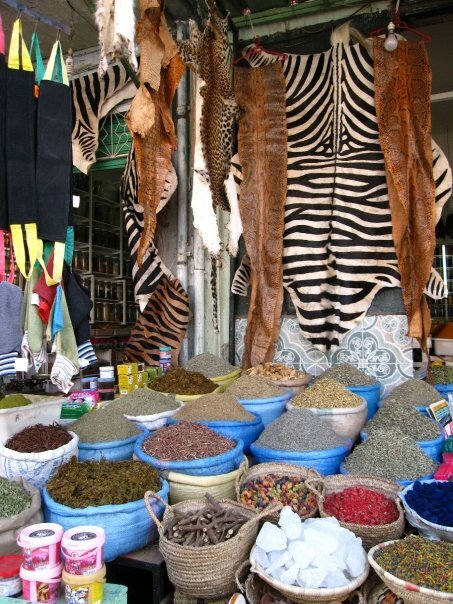 Scented bars and olive extract scrub used in traditional Hammams leak perfume into the Arabian air, camouflaging the smell of days-old meat hanging grotesquely from hooks nearby. As dusk gathers the square pulses under glowing lanterns, spotlighting the open-air food market. Each stall has a number that rhymes with an enticement to try their wares; how can you refuse "117, takes you to heaven?" Generously portioned couscous dishes are served with lemon chicken or melt-in-the-mouth lamb, simmered in aromatic spices and luscious figs, apricots and dates. If you are feeling adventurous you can sample snail soup, so long as the goat’s heads being touted nearby do not deter you. As you lay down in bed, stomach full and eyes heavy, sleep evades you. 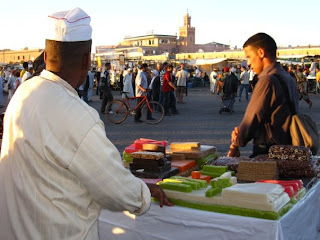 You picture the market, stained saffron with sand from the Sahara Desert, as its smell of smoke and spice flows like a tidal wave through the open window. Unlike any other city Marrakesh imprints itself, unforgettably, on every one of your five senses.